Team takes 6th place with 339. Alec advances with 81. The varsity boys golf team competed in The SWDAB Sectional Golf Tournament today at The Golf Club at Yankee Trace. This event was contested on the Heritage (par 36) and Legend (par 36) nines. 13 Division 1 high school golf programs were represented today. The low four team scores and next four low individuals not on qualifying teams punched their tickets to the Division 1 District Golf Tournament next week at Beavercreek Golf Club. Congratulations go out to the Centerville Elks (287), Butler Aviators (314), Springboro Panthers (315), and Lebanon Warriors (318) for qualifying as teams for Districts. Tyler Goecke of Carroll tied Butler’s Austin Greaser with scores of -6, 66 to take home co-medalist honors today! 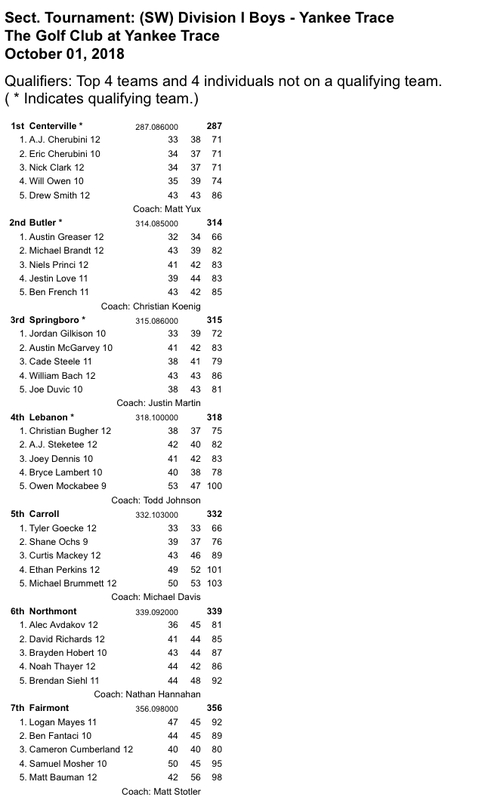 Carroll’s Shane Ochs (76), and Fairmont’s Cameron Cumberland (80) were the next two individual qualifiers behind Goecke. 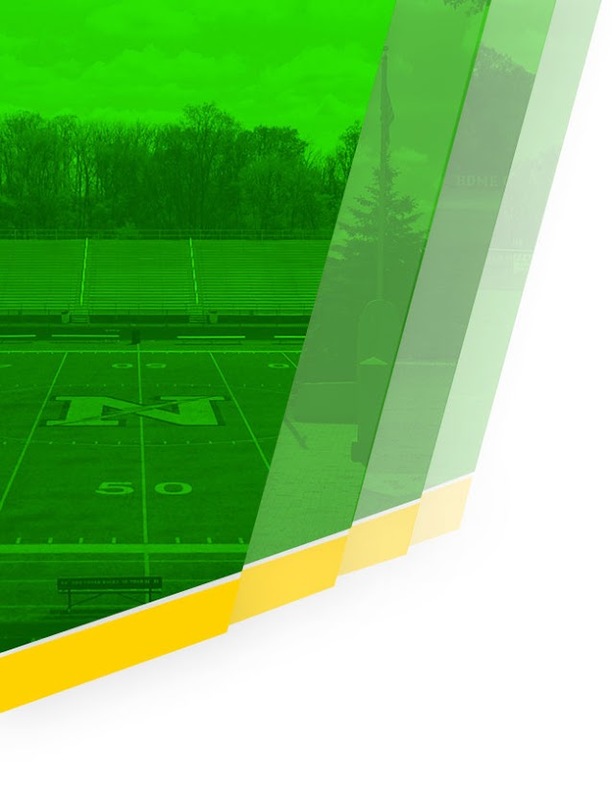 Leading the way for the your Northmont Thunderbolts and securing his right to play at the District Tournament next week was senior Alec Avdakov. Alec birdied the par 5, first hole to jumpstart his round and added another birdie on the par 5, sixth hole to fire an even par 36 on Heritage. He played the Legend side in 45 to post his best ever sectional performance of 81. That 81 secured him the 4th individual qualifying spot out today. Senior David Richards was knocking on the door all day long. He made 5 pars on his first nine holes and was in position to make a move on the back nine. He was only able to muster two more pars coming in amidst a string of bogeys to post 44 on Legend for a total of 85 today. David has had a remarkable senior season for the T-Bolts. 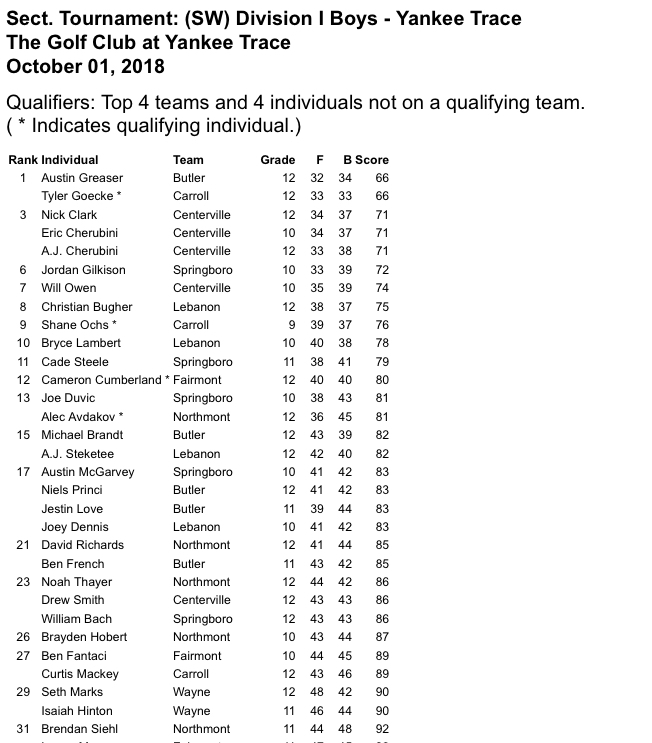 He was our stroke average leader all year and had several tournament scores in the 70s highlighted by a 78 at the GWOC postseason tournament last Thursday. Congratulations, David on a fine high school golf career. Senior Noah Thayer had his high school golf career come to a close today as well. Noah ended in fine fashion with a very respectable score of 86. He relied on a hot putter (29 putts) to hole 6 pars in his final event for the Thunderbolts. Noah played in every varsity event this season and his contributions to the Northmont Golf Program will be sorely missed and not soon forgotten in the future. Sophomore sensation Brayden Hobert made five pars on his opening nine holes today. A costly quadruple bogey 8 on the par 4, fourth hole did not slow him down as he went out in 43 strokes on Heritage. Brady made a string of pars early in his back nine and was then struck by the dreaded “other” when he made a triple bogey 7 on the par 4, 15th hole. To his credit, Brady parred the next hole on his way to 44 on Legend and 87 for the tournament. Junior Brendan Siehl had it going early. He made five pars on his first seven holes before suffering a double bogey 6 on the par 4, 8th hole followed by a triple bogey 7 on the par 4, 9th hole to post 44 on Heritage. The Legend side proved to be unkind to Brendan as he came home in 48 strokes to post 92 for the tournament. Brendan showed a temendous amount of poise and his ability to overcome adversity today. We are looking for big contributions from Brady and Brendan in 2019. 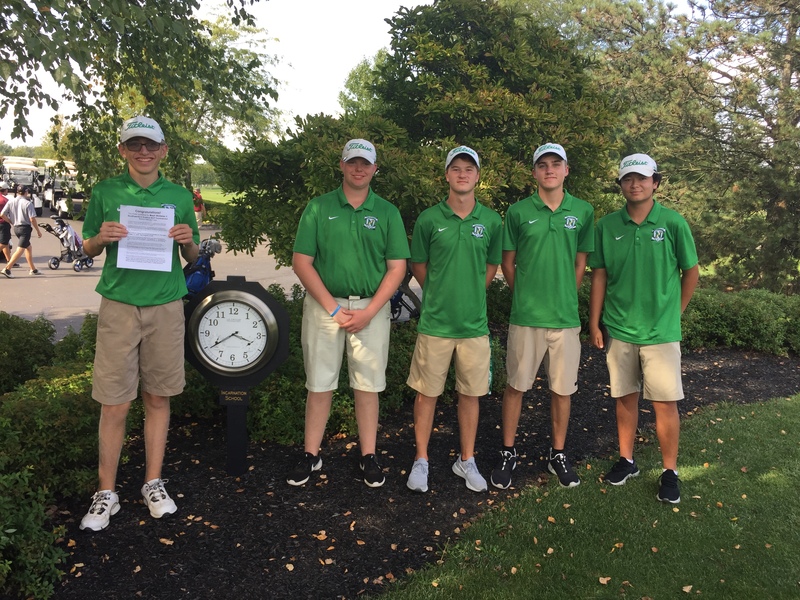 Northmont’s team total of 339 was good for 6th place out of 13 teams in the loaded tournament field today. These boys have had a season for the record books with two tournament wins, and two tournament runner up finishes in 2018. The Thunderbolts finished the regular season with a 9-2 overall record. They placed 7th out of 19 teams in the final year of the powerhouse GWOC conference. We will be able to fully reflect on how great this season was sometime soon. 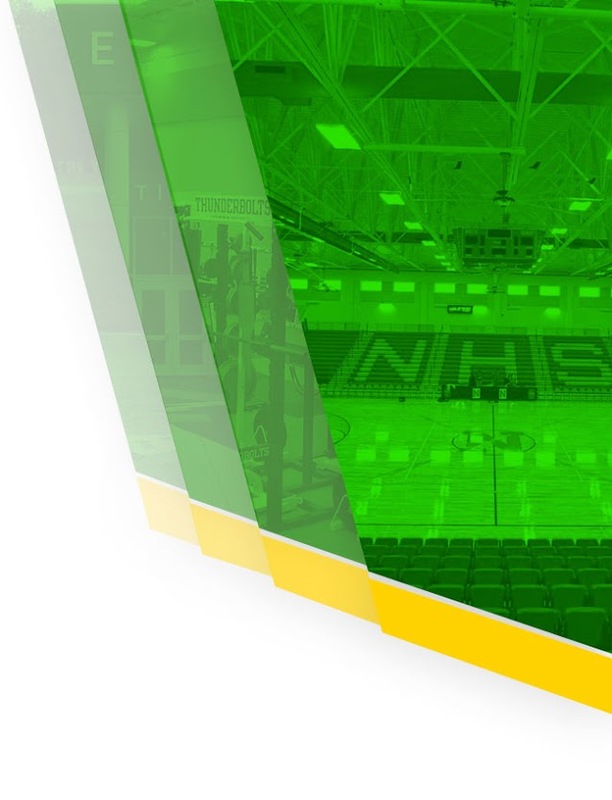 For right now our sights are set on the District Tournament next week. 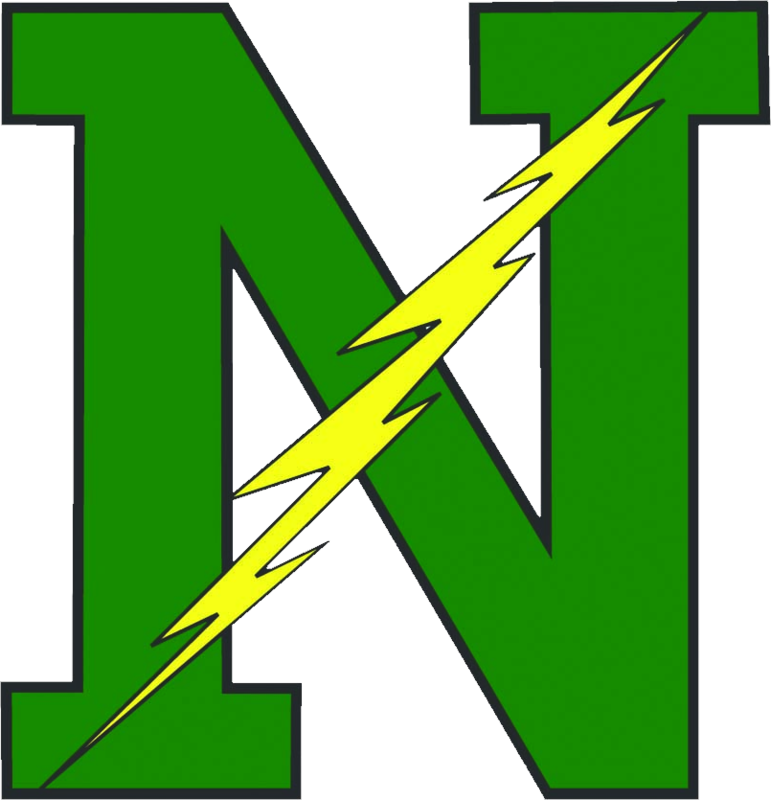 Alec is the second Northmont Thunderbolt to qualify for the District Tournament in two years (Cole Stephens 2017). Let’s hope Alec can keep it going as he continues his quest to reach the State Tournament in two weeks! Congratulations, men! Today left us with a lot to be grateful for and a lot to look forward to. We will see you on the links at Beavercreek Golf Club next week!